Mr Orban, who bashes Brussels even as he accepts colossal subsidies from EU taxpayers, arrived at the debate both late and defiant. 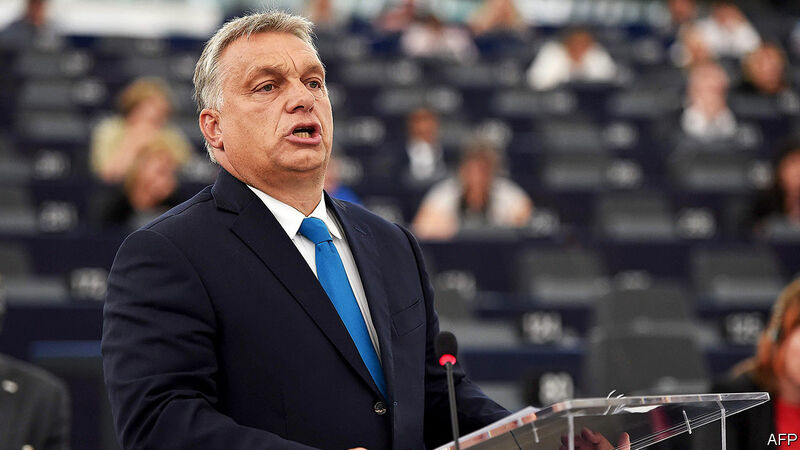 It was âinsultingâ, he told the chamber, that they wanted to âstrip Hungary of the right to represent its interests in the European family where it belongsâ. Supporters of the Hungarian populist, including Nigel Farage, the chief cheerleader for Brexit, came to his aid. But the following day MEPs voted with more than the required two-thirds majority to start the process of sanctioning Hungary under Article 7 of the EU treaty. In doing so they collectively stated that Mr Orbanâs government posed a âsystemic threatâ to democracy and the rule of law. Notably, another conservative leader often accused of excessive nationalism, Austriaâs Sebastian Kurz, told his party to vote agains t Hungary. Mr Kurz is a fellow-member of the European Peopleâs Party, the main right-of-centre political grouping at the parliament. What is the Waffle House Index? Was this Donald Trumpâs most repugnant tweet? How big will the iPhone get? In theory, the vote could lead the EU to impose sanctions on Hungary and even to suspend its voting rights. But in order for this nuclear option to be used, the leaders of the EUâs other 27 members must unanimously agree. That is unlikely because Poland is currently facing the same procedure; and Poland and Hungary have vowed to supp ort each other. Mr Orban may not care all that much about the vote. His primary audience in Strasbourg was not MEPs but domestic voters, and the defeat will only serve to boost his popularity, as he presents himself as a valiant defender of the beleaguered Hungarian nation against the hostile external forces (that pay its bills). âThese debates help him to mobilise his own camp and will work much more at a domestic level,â says Andras Biro-Nagy of Policy Solutions, a Budapest think-tank. The lead in the polls held by Mr Orbanâs Fidesz party is anyway unassailable. More than 50% of Hungarians back it against a fractured opposition. The EU vote, though expected, infuriated Fidesz MPs and MEPs, who said the punitive action was in revenge for Hungaryâs determination to stand firm against mass migration. The decision was an act of âpetty revengeâ, said Peter Szijjarto, the foreign minister. The Sargentini report was full of âunjustified, untruthful accusationsâ . The criticisms have long been resolved with the European Commission, government officials argue. Mr Orban, they note, has won three elections in a row, partly by promising to crack down on migration and the NGOs which support it. His team reckon that he is being punished for fulfilling his democratic mandate.